The British Gazette » The TSR 2: The sad story. Herewith an hour long professionally made documentary detailing the development and the scrapping of the British Aircraft Corporation’s TSR-2 (Tactical, Strike, Reconnaissance 2) aircraft. The cabinet papers of the Wilson Labour government relating to the cancellation of the aircraft in 1965 have been destroyed to avoid the truth from reaching the British People. However the British Gazette can reveal the main reason for the cancellation was pressure from the US politicians following fierce lobbying on Capitol Hill by General Dynamics who were developing the swing-wing F-111 – which proved to be more expensive and of inferior performance that the TSR-2. An example of this superiority (TSR-1) and inferiority (F-111) was demonstrated most graphically by one of the test pilots flying the TSR-2: Deciding to go supersonic for the first time, the pilot – for health and safety reasons – decided to activate the reheat (a device that increased the thrust) from the Bristol Siddeley Olympus B.Ol.22R (Mk. 320) turbojet (of which the TSR-2 had two) from a dry thrust of 22,000 lb to 30,610 lb, on only one engine. On this less than maximum output the TSR-2 was able to out accelerate the accompanying English Electric Lightening interceptor – one the fastest accelerating interceptors of all time! By comparison, the aircrews of the USAF’s F-111 suffered during the Vietnam War due to the aircraft’s poor acceleration. 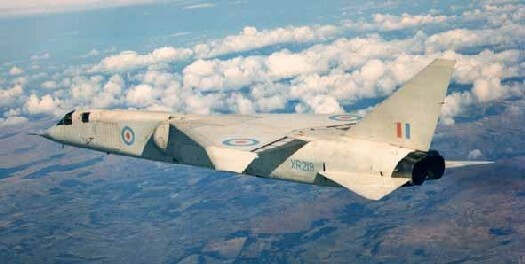 Despite is fighter designation, the F-111 was a bomber that had to rely on its advanced terrain following radar and ability to fly at very low level to get through to its target: it could not “mix it with fighter aircraft” – an ability so clearly possessed by the TSR-2 able to escape from one of the most capable interceptors of the day on less than full power! It was this ability to trounce absolutely the F-111 that cause the Americans to advocate so strongly for the TSR-2 cancellation. Whilst the accusation directed at the British Imperial General Staff that the British soldiers of the Great War were “Lions led by Donkeys”, there is little doubt that the RAF aircrews (along with their brothers-in-arms from the other services) have been Lions led by Traitors. WARNING: This documentary contains material which those of a patriotic disposition may find upsetting. The whole TSR-2 story is highly exaggerated nonsense and has little to do with reality .F-111 had better field performanc overall, TSR.2 had better aerodynamic perfomance in the arena for which it was designed F111s vg wing made it somewhat more versatile and efficient, but a lot was in areas that USAF didn’t need. F-111 turned better at low speed, TSR.2 accelerated a lot better and would probably have made its performance specs, wheras F-111 didn’t. F-111’s engines were more miserly in fuel usage, TSR.2’s were more powerful power came on faster. Remember, though, TSR.2 was optimized around that mission and didn’t have to worry about doing a whole series of tricks. On the other hand, TSR.2 woulld have been a beast to maintain. Brits really didn’t worry much about maintainence when designing aircraft in those days. Assuminge everything worked, TSR.2 had better TFR and recon capability, not sure whose strike avionics was better. I suspect TSR.2’s would have been better slightly than the F-111A’s, but not as good as the D’s (if only they had worked) or the Fs. A lot of stuff is still claimed about ‘US interference and pressure’ and a wanton desire to sabotage the industry by the Wilson government illustrated by the breaking up of not only the TSR-2’s save for two, in building, but also the scrapping of the production equipment to stop a future government re-starting the project. From the RAF F-111 order to it’s 1968 cancellation – when economic problems accelerated the role ‘East of Suez’ ending – the fact was that the purchase of the projected 50 F-111’s could be financed over years, TSR-2 was all up front. The head of BAC, Sir George Edwards, had a company policy of once a project is cancelled, scrapping all of it, including production equipment, since he thought it unhealthy for his company to not move on to new projects right way and no dwelling on what might have been. He did the same thing when the Vickers 1000 jet transport was axed in the mid 1950’s, everything associated with it was scrapped and later the BAC 3-11 wide-body airliner. And last but not least,TSR-2 engineers didn’t go to America after it was cancelled,almost all of them started working in Concorde project . This untold story about TSR-2 is nothing but a compassion babble. TRS-2 was a paper plane. Only 4 prototypes were built and none of them achieved full operational capability as they had been experiencing serious technical problems! Everything about TSR-2 was on the paper. This documentary is merely an emotional attachment that has long outlived its purposes.